So what happens when you inherit a home only to find out it's haunted? Lets cut to the chase here. One ghost would be more than enough reason for most people to exit stage right. Several ghosts is just downright creepy. But then we have that other group of people. Those that would probably let their curiosity get the better of them, and stick around for a bit. Sure. It would make for an excellent story down the road, if anyone would believe. If the ghosts seem more or less harmless? Why not at least see what's up? Until that is, you realize not all the ghosts are harmless. Danielle, (Aiyana Irwin) after arriving for inspection and clean up of her newly inherited home, realizes just what I've written above with one big difference. Adding to the fact her house is haunted, by multiple spirits, is one huge revelation: these ghosts can manipulate and use any of the objects within the home; and also have the ability to inflict harm with any of these household objects. How is that for a game changer? How is that for a reason to get the hell out of Dodge? Essentially, this is the setup for The October Flowers. I may have condensed the entire film into these few short lines, but this is the story being told. Maybe not entirely unique to anyone who loves ghost related media, but done well none the less. Although more a dramatic thriller than a horror film, director Clay Moffatt knows the art of the setup and doesn't waste any time getting his show on the road. The resulting film may be a little slower paced than many would like, but even more will appreciate the effort. I know I did. 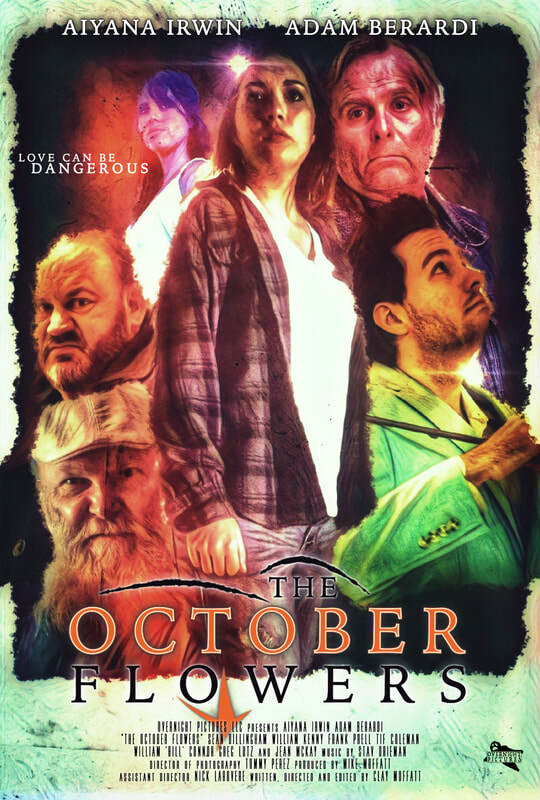 For a title with a micro budget, The October Flowers feels much larger. This is probably due to the fact that the film takes place within a location that makes it easier to control. For audio, the majority of the film is indoors making things so much easier. Same goes for the cinematography. Having complete control of your location allows for a much more polished production than you could otherwise afford. The visuals and audio simply look really good. The characters themselves? Let me just write they were different. Many would argue that The October Flowers has more than it's share of ups and downs when it comes to the acting; and to some extent that is true. Many of our ghosts seem distant and sometimes, like they're from another film. For me though, this approach worked. Why shouldn't the ghosts feel distant and weird? They're ghosts! I can't lie and say I thought all the acting was excellent all the time, but mostly it worked from my point of view. The strange feeling of watching these spirits was amplified by the occasionally distant feeling. Add this attribute with the general story and feeling of the film and for me, it was a great addition. The October Flowers isn't your standard scare-a-minute ghost title. There is a process here that's meant to be appreciated. Maybe this isn't the best title for the impatient or gore jaded film buff. The action is very limited, and mainly added into the ending for climactic reasons. This is a ghost story more focused on drama than scares. Breaking things up is a small amount of comedy via some unusual ghostly characters. Just the right amount I should add. Considering it's roots in retro movies, The October Flowers accomplishes it's main goals without a hitch. What I personally really enjoyed was the amount of "character" these apparitions had. For a micro film that runs under seventy four minutes, a lot of different ghosts play host to a lot of different personalities. I did wonder if this title would have been better off with less ghosts in the house? I also wondered if many of these characters were needed at all, to move the story forward? The answer was pretty simple. It didn't matter. The large number of characters maybe took away screen time that "could" have been used to flesh out a smaller number, but at the same time they made the haunted house feel larger. With a much richer and more vibrant history. I really can't write much more without giving away the precious details, so let me just close with this. The October Flowers kept me watching, and that's what it's all about. If you're looking for a well done micro film, that is "actually" interesting, you've found one here. I think so anyhow.